This idea’s truth rings deep. 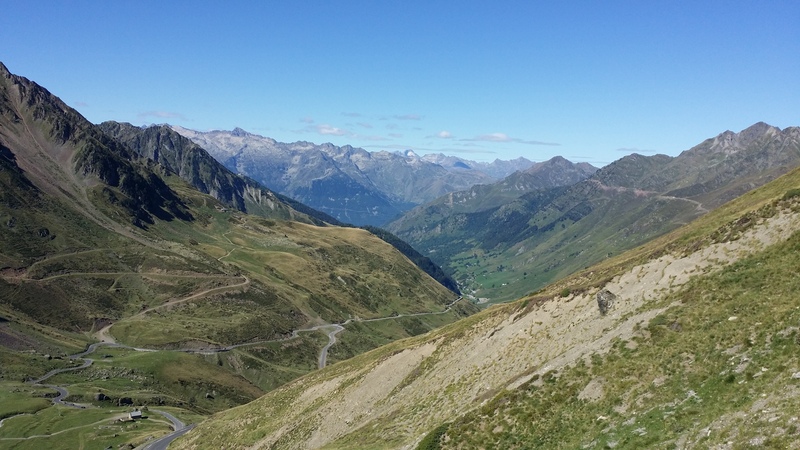 Unlike the traditional blog, this one is focused on recommended behaviors, and there is exactly one reason for that…I wish I had something written to guide my thinking before I prepared to travel to the most famous cycling mountains in the world. The focus is to help an American prepare for this once-in-a-lifetime experience. 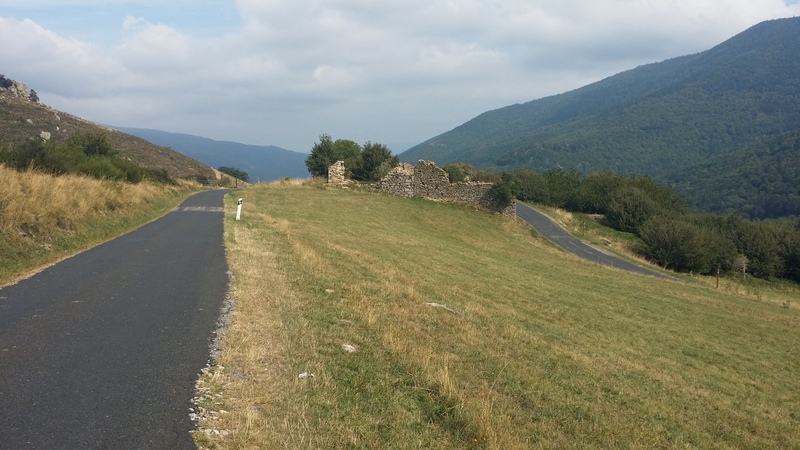 A descent in the Pyrenees includes ruins from long ago. Cycling the Pyrenees is a dream-event for any experienced cyclist, but it remains a bucket list experience monopolized by Europeans. 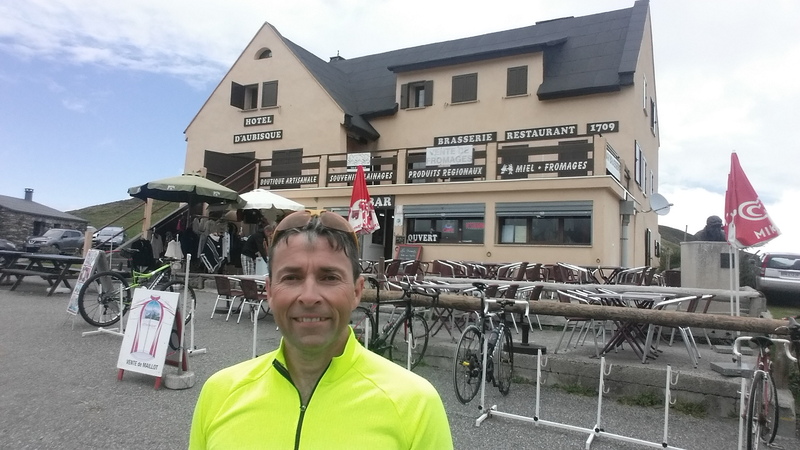 Hopefully, by combining this blog with my stories and experiences riding the Pyrenees will motivate you to put it on your bucket list. Here are my 10 to do items to get the most out of this trip. 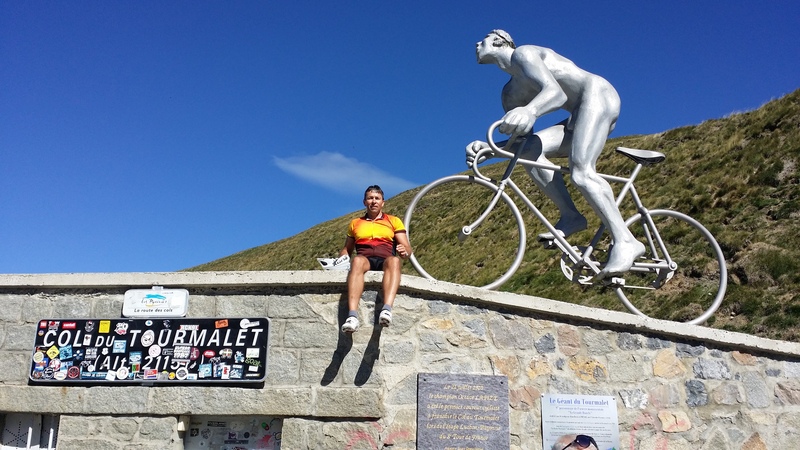 Top of the Tourmalet…Tour de France is made here! Fitness is a pre-requisite to enjoying the trip, not a result of doing the trip. Too many folks show up in France, thinking that riding the most famous cycling mountains in the world will create super fitness. Some even use the trip as a weight loss clinic. BAD idea on both fronts. Start this trip with a body that is as lean as reasonable and still healthy. Every pound/kilo of body weight that you carry will go with you up and down every mountain. Imagine two twins, one carrying 20 pounds while the other has 30 pounds. Walking in and out of the store, they both can travel at about the same rate. However, once they have to take them up 4 flights of stairs, the difference between 20 pounds and 30 pounds can become a big deal. My recommendation is to be as thin as you can be and still be healthy before you leave. On our trip, the bigger folks were slower up the hills than the littler people. On the last day, when we had a sprint up a 4 km hill, the fastest finishers were the lightest framed people in the group. Arrive a few days before the trip to address jet lag. Getting into European sleeping and eating rhythms before hitting the saddle will be a worthy investment. Although the traverse can be done in 5 or 6 days, you will need 9 or 10 days of from work to this a great experience. Winds travel from West to East, just like the states, so cycle from the Atlantic to the Mediterranean, not the other way around. We met folks doing what we were doing, and some were going the other way. The folks who were going east to west looked whooped! Our last day we travelled with a bit of a tail wind as well. Average temperature increases by a couple of degrees, each day, as you move west to east. We started cool and gradually warmed as we travelled east. I can’t imagine riding into continually cooler weather. All weather is possible in the Pyrenees. I wore long pants and a vest during some evenings. I wore layers as we neared the tops of the Cols. On the last day, I wore swimming clothes for the Mediterranean Sea. I had a towel, a wool cap and gloves, and everything in between. Although you don’t need multiple changes of clothes, you do need several types. Pay attention to your packing list. Don’t cut corners. Roads up the side of the mountains. Character is made here. Plan for eating to be social. In the USA, the evening meal can also be social, on occasion. In France, food at the end of a day is an event without a compromise. Multiple courses, a glass of wine, unlimited bread and butter and lots of time to talk between the courses are normal. Expect a quality of presentation that amazes. More than once, I wanted to take a picture of how beautiful the dishes looked! Don’t assume that electrical outlets to be plentiful. More than once, we would have one outlet per person in a hotel room…that is it! Plan on allocating adequate time to charge your electronics, as you may have to charge in shifts. Remember, most of the buildings that you stay in are older than your grandparents and were retrofitted for electricity in the last few decades. They aren’t wired for the American hodge-podge of devices that all crave power. Stop riding and set aside goals for time and pace. My best photos came from my cell phone, in places that I would otherwise casually look at and keep riding. The Pyrenees have been featured in the Tour de France since 1910, and none more than Col de Tourmalet. Enjoy these things. Regardless of confidence levels or language skills, talk to people. I had a 10-minute conversation with a group of Basques who didn’t speak a word of English. I don’t know French, so we made a lot of signals, gestures, and used few words. That said, it was most memorable part of that day! Restaurant is kind of old…. To put an order of magnitude on this, I can’t imagine going to the grave without a Pyrenean experience. I am glad that I did it is an understatement. During the next to last day, during some prayer time on one of the mountains, I remembered that the closing words of Heaven include promises for those who come to him to receive heaven. In my humble opinion, there will be glimpses of the Pyrenees in Heaven. Previous postRunning in the New Mexico Sun…with my son. Next postPyrenees: a trip inside as much as outside.